The basic function of a thickener is the separation of solids from liquids, and in many cases is used to concentrate very dilute slurries to feed to another process, such as a filter. Typical applications include dewatering concentrates, countercurrent solids washing systems, solids removal from plant effluents, etc.. Often, chemical flocculants are added to the thickener feed to improve the settling rates and quality of the clarified water or liquid. Sepor specializes in the application, design and manufacture of pilot plant and small commercial size units. Experience in mineral, chemical and water treatment plants thickening and clarifying circuits enable us efficiently design and produce solids/liquids separation equipment. Gear mechanisms are running in oil type. Thickeners are available in mild steel, stainless steel or other corrosion resistant materials. Drive Mechanism: Running in oil type reducers with output shaft coupling. Non-lift type. Rake Assembly: Mild steel shaft and two arm rake assembly is standard. Superstructure: Mild steel formed plate (Beam type on 12′ and larger units) with mechanism and gear motor mounting areas. For mounting on tank rim angle. Gear motor Drive: 3′ and 4′ with v-belt drive and 1/3 HP gear motor; 5′ through 7′ with 1/2 HP gear motor; 8′ and 10′ with 3/4 HP gear motor; 12′ and 14′ with 1 HP gear motor. Motor and gear reducer may be supplied instead of gear motor. Drive Guard: OSHA Type, constructed of structural steel. 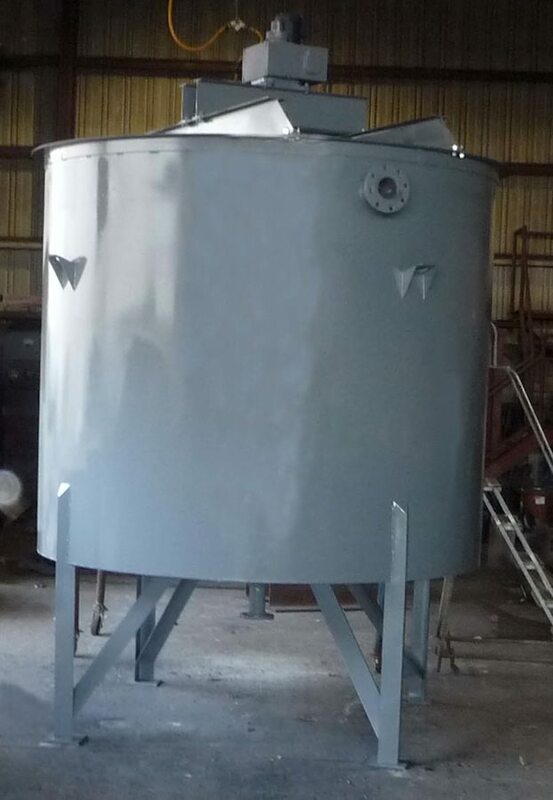 Feed well: Mild steel with overflow launder and underflow cone, both with flanged discharge and support legs to position discharge cone off the floor, as standard construction. Paint: Standard primer and one coat of enamel. Corrosion Resistance: Thickeners are available with wetted parts constructed of stainless steel or lined with other corrosion resistant material, such as neoprene, rubber of other elastomer covering. 050E-001 3 3 7 1/4 350 Lbs. 050E-003 5 5 20 1/4 1,400 Lbs. 050E-004 6 6 28 1/4 2,100 Lbs. 050E-006 8 6 50 1/3 3,350 Lbs. 1. The surface area determines the capacity of the thickener. 2. Feed velocities must be controlled, to not exceed certain parameters. 3. Overflow velocities are also controlled, to balance the clear water overflow with the balance of the thickener operations, such as feed inflow, settling zones, compression zones, and compacted solids zones. 4. Withdrawal of compacted solids (underflow) must likewise be controlled to maintain a balance in the thickener. The basic function of a thickener is the separation of solids from liquids, and in many cases is used to concentrate very dilute slurries to feed to another process, such as a filter. Much of the time, flocculants need to be used to help the solids settle in a reasonable time frame. Typical types of flocculants are cationic and anionic, named for their charge. Generally, these are high molecular weight polymers of a long chain design to attract many fine particles that would take many hours to settle individually, due to the surface tension of water and liquids, like charge particles continually repelling and dispersing and other forces which are at play in a thickener. These forces are overcome by the flocculants by neutralizing any charges dispersing solids, coagulating the fine solids and allowing gravity to pull them to the bottom of the thickener. Solids discharge from a thickener are typically in the range to 25% solids by weight up to 50% solids by weight (for thickeners used for concentrating solids). In addition to the tank, conventional thickeners have rakes, which slowly push the compacted solids towards the discharge point, typically located in the center. The key to operating a thick- ener is the settling rate of the solids, if it is too fast, solids will build up too quickly and pile un on the rakes, causing the rakes to stop operating or in serious cases, break. There is a nice range from which thickeners will operate in, and it is necessary to keep them there. By conducting simple settling tests in a 1000 graduated cylinder will give one a ball part settling rate to start with, and adjust it in the thickener as operations dictate. This means if solids build up too fast, decease the settling rate, if solids are in the “clear” water, increase the settling rate or perhaps investigate the addition of a cationic coagulating polymer.